Ferry to Fat Boy anyone? 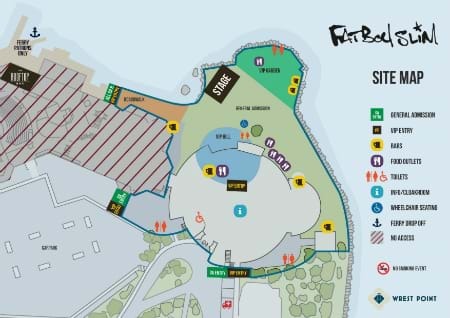 Stuck for ideas on how to get to Fat Boy Slim this Sunday? Well we've got ya sorted! There's a FERRY service running with an on-board bar (eek. EXCITED) which means you'll have your designated driver sorted! You'll arrive in style so if you're coming from either Bellerive or the City this is an awesome option, and it's just waiting for you to take full advantage! The Rooftop Bar will be open after the show with Tassie DJ Hugo Bladel turnin' up the beat! Plus here is a site map so you can know whats going on before you get there!! !